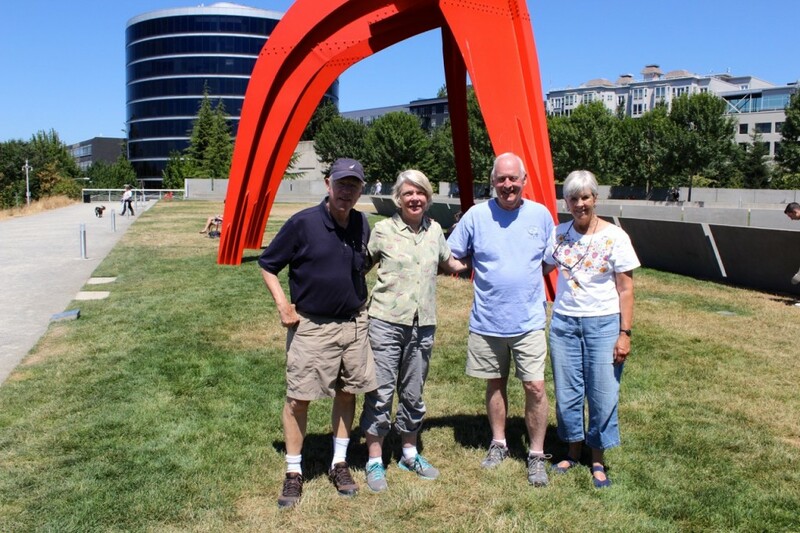 We arrived in Seattle on July 3 where we spent three days. It was a terrific three days! After saying our goodbyes, we left the ship at 9:15 am and were met by our old and dear friends, Rick (Embry’s first cousin) and Karen McMichael, who drove us to their home in Burien, a southern suburb of Seattle. 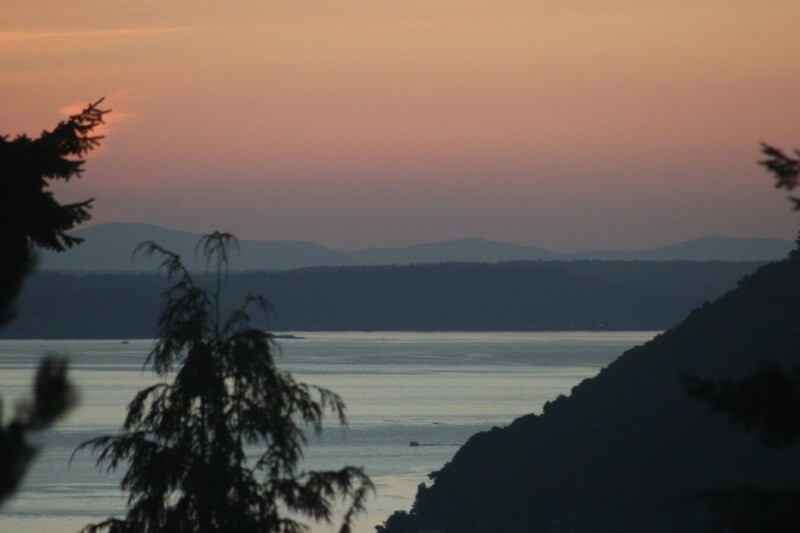 We had visited them before and remembered that it was a beautiful home overlooking Puget Sound, but the spectacular views surprised us again. The next three days were a whirlwind. That afternoon we drove to see Mount Rainier, where I was struck with how racially and ethnically diverse our country is compared to those we visited. That was followed by dinner at a great seafood restaurant on the sound. The Fourth of July we visited the Pike Street Market and the sculpture museum in the morning, then that evening viewed the fireworks from the highest hill in Seattle. On Sunday, July 5, we accompanied Rick and Karen to Southminster Presbyterian Church, a small, family-oriented, very friendly church, with a screen and projector for Power Point accompaniment to the sermon and hymns, then lunch at their house with my old friend from my Japan trip in 1962, Libby, and her husband, Don. That evening we enjoyed a steak cookout on their secluded back deck, and the next morning a three mile hike down to the park on the sound beneath their house before having lunch at a neighborhood bar/restaurant and heading off to the train station. There we met George Wright, a colleague and good friend of Embry’s from Mathematica days, and his wife, Diana, for a mini reunion, most of which was spent in the waiting room of the Amtrak station, talking about old times and what these two activists and reformers had been up to in Seattle. It was quite a three days and great to be back in the U.S.! Karen dropped us off at the Seattle train station around 2:00 pm so we could meet George and Diana, but at 7:45 pm we were still waiting for our train, The Empire Builder, which had been scheduled to leave at 4:40 pm. When we returned to the station around four o’clock after coffee with George and Diana , there was a long line to board the 4:40 train to Chicago but no Amtrak employee at the counter. I waited until it was close to boarding time. There was no announcement and no sign of Amtrak personnel anywhere. A national parks guide who would be joining us on the train had alerted us that there might be a problem and that late departures were not unusual. If fact, he said that it was rare for an Amtrak train to leave on time from this location or for that matter, any location. That there was no information about The Empire Builder at the time of departure, I thought a little odd. At five o’clock, almost a half hour after the scheduled departure time, a woman wearing a blue uniform casually wandered into the waiting room and at the top of her lungs announced there was an unexplained delay. You could leave the line if you wanted but be back in the station by five-thirty. It was very difficult to make out what she was saying when she reappeared every half hour or so to provide updates, but as best we could tell, the situation was this: the reason for the delay was that our original train was several hours late due to equipment problems—it had been due around noon—and when it did finally arrive, it had to be diverted to replace another train which had broken down. They were waiting for a third train which could have been diverted to take the passengers to Chicago, but unfortunately there were some issues with that train as well. More information would follow. By seven o’clock, however, there was good news. One of the broken down trains had made it the station, but additional repairs needed to be made. No further information was available. Another Amtrak employee dressed in blue yelled out they were opening the doors to the waiting room to provide some relief from the oppressive heat (since there was no air conditioning in the station), but if anyone tried to leave through those doors they would not be allowed to come back inside the station. I was wondering why there was no PA system, why no information displayed anywhere about trains and why all the trains were breaking down. As we stood around complaining that we would miss all the great scenery in the Cascades since it would be dark, someone else chimed in that it was not always Amtrak’s fault because Amtrak really was dependent on the freight train companies like BNSF, which owned the tracks. Even if by some miracle they could fix the train that broke down that was supposed to replace the train that also had broken down that was supposed to be used to assist another train that had broken down, you still had to get the ok from cargo train companies to find a time slot. Another person said that we should be grateful the trains were running at all since last week the tracks were shut down for the entire week due to forest fires. Welcome to passenger rail transportation in the U.S.! As a point of reference, we had some 25 different train connections in the nine countries we visited in Europe, Asia, and China. Every one of them was on time to the minute. Suddenly a few minutes after eight, the Amtrak representative shouted something unintelligible, and everyone rushed to get a spot in line. By 8:30 pm, The Empire Builder had left the station–only four hours late, leaving us scant hope for making a two hour connection in Chicago– and we were ensconced in our tiny two-seat/bed sleeper “roomette.” Because we got off to such a late start, as we had feared, we missed all of the spectacular scenery of the Cascade Mountains, which we passed in the dark. 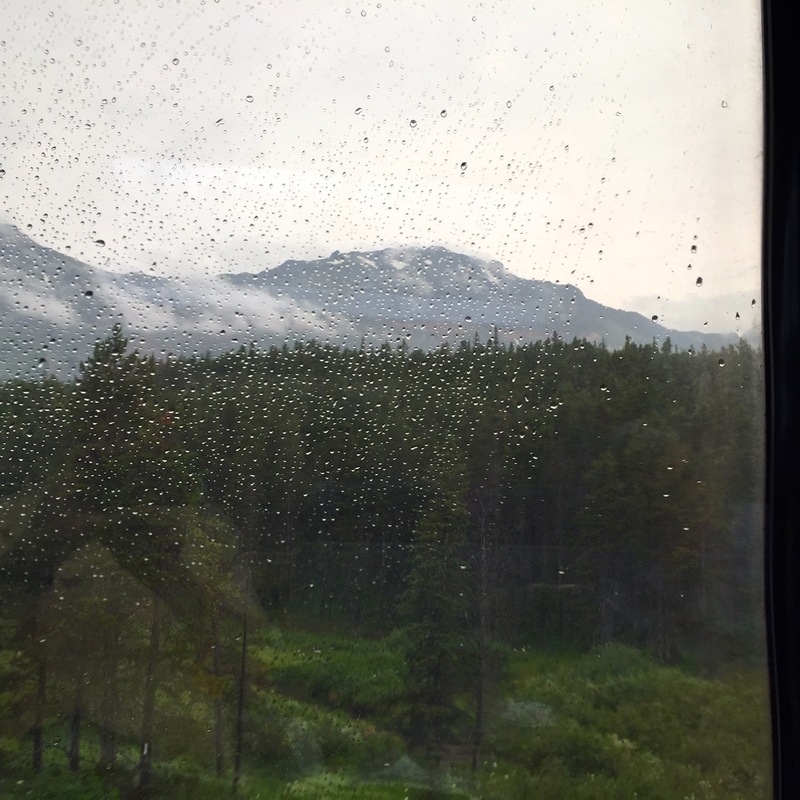 On Tuesday, July 7, our train passed through the Rockies beginning around seven in the morning and lasting through noon. While it was foggy and rainy with limited visibility, the scenery was still spectacular with clouds and mist creating a magical effect. It reminded us a lot of the China trip from X’ian to Chengdu over the mountains. We later learned that The Empire Builder, the train that was “only” four hours late, was traveling with one less car than it was supposed to have, due, naturally, to equipment failure, meaning that there would not be enough seats for all the passengers (all of whom, of course, had reserved seats and had paid their money). The “solution” was to partially convert the dining car to a passenger car and to allow people to sit in the aisles or to stand. After several meals with other passengers, we came to understand that the problem was not Amtrak. It was our mistaken assumption that trains were primarily a form of transportation. Our fellow passengers reminded us that trains in the U.S. have nothing to do with getting from point A to point B except in the Northeast Corridor. If a traveler actually wanted to go somewhere, he or she would drive or take a plane. The purposes of taking a train in the U.S. are sight seeing and adventure. Of all the people we talked to, only one couple had traveled on an Amtrak train that was actually on time, but because trains were for other purposes our fellow passengers were not upset. For example, a Boston couple, originally from Korea, spent their previous nine days traveling all over the U.S. by train, and no train was less than four hours late. It did not bother them all that much though the husband did say they would never take a train again outside of the Washington-Boston corridor. Another couple our age from Iowa experienced two delays coming from the Midwest to Seattle, a 12 hour delay due to a freight train derailing directly ahead of their train and a six hour delay due to the train engineer exceeding his daily time limit of hours allowed to drive the train. Since the assistant engineer had been laid off due to budget cuts, they had no choice but to park the train on a side track until a replacement engineer could be found. No one seemed particularly bothered. 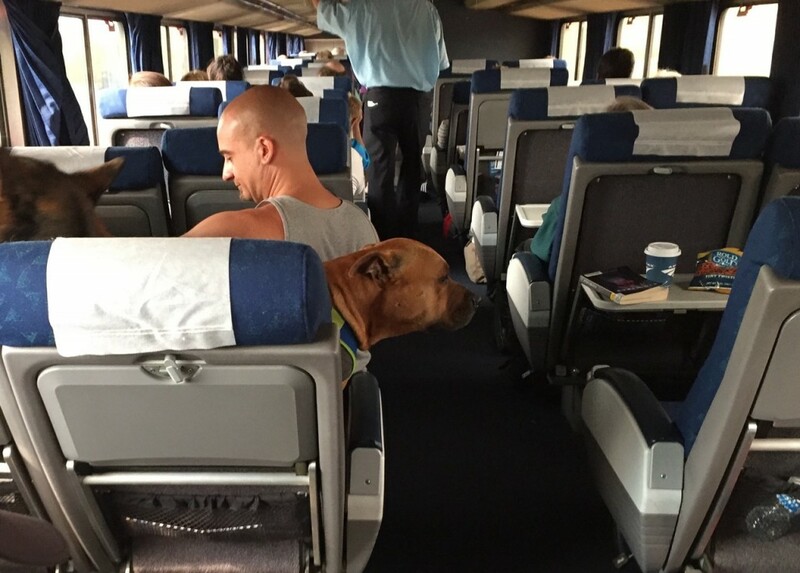 This was Amtrak. This was what you expected. While this description was not exactly accurate—later in the trip we did talk to several people who lived in small towns along the route who actually did use the train to get from point A to point B—it probably did apply to the majority of passengers. I suppose you could say that our “problem” was that we had been in countries in Europe and Asia where passenger trains were actually used for transportation and where trains were the preferred means of getting around, compared to cars and planes. I suppose we knew all this about U.S. trains before our trip but had forgotten. In any event once we got the paradigm right, we could begin to enjoy the trip across the country by rail, the last leg of our journey. I also must give Amtrak credit where it is due. The Amtrak staff were courteous, friendly and efficient—a vast improvement from what it was like when we took the train from DC to Savannah several years before. They worked hard and tried hard to please. Some of the food was not that bad either. The train cars or “carriages” as they are often called, were designed well and in reasonably good shape. There was also a club car with an observation roof. So Amtrak is making an effort. Several people told us that problems related to equipment failure and delays were for the most part beyond Amtrak’s control due primarily to insufficient government financial support (which is present in all the countries with good rail systems that we visited) and to the freight train companies calling all the shots on track usage. The Empire Builder chugged along. 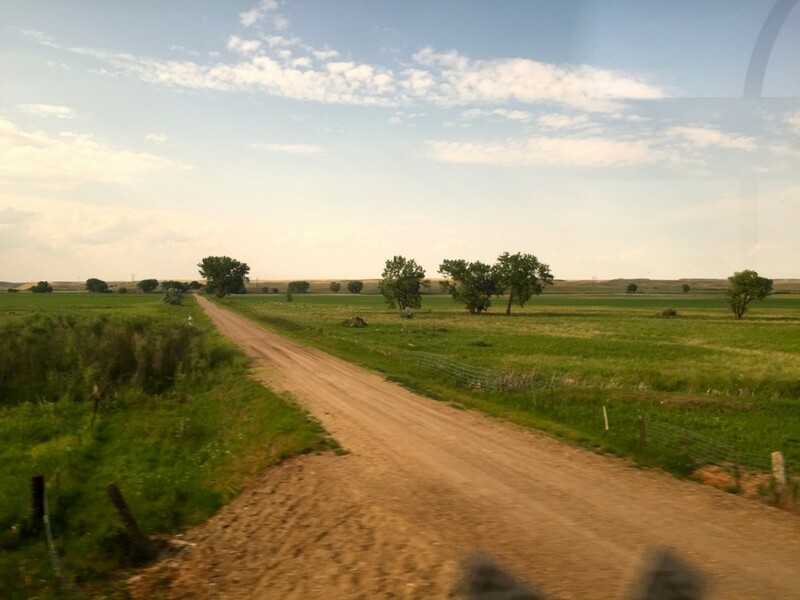 Eventually the high mountains and mist gave way to foothills and partly cloudy skies, and then to prairie with occasional cows and horses grazing, followed by endless wheat fields. Our country is as vast and beautiful as any we visited. In fact the grasslands looked very much like the steppes of Mongolia and the plains of Siberia and the mountains in the mist, a lot like China. What made the view different from what we saw in Europe and Asia was the absence of anything similar to the small villages that dotted the landscape. In fact it was surprising how few houses of any type we saw. Somebody was growing all this wheat and raising cattle, but it was not apparent where they lived. That changed after Havre, Montana, when small farm houses and mobile homes started to appear, but whoever lived in them was not making a fortune. Some of the homes were close to falling apart. We learned later that most of the poor housing was on Indian reservations. While the train was jammed packed with not enough seats to accommodate everyone, that did not seem to keep people from having a good time. 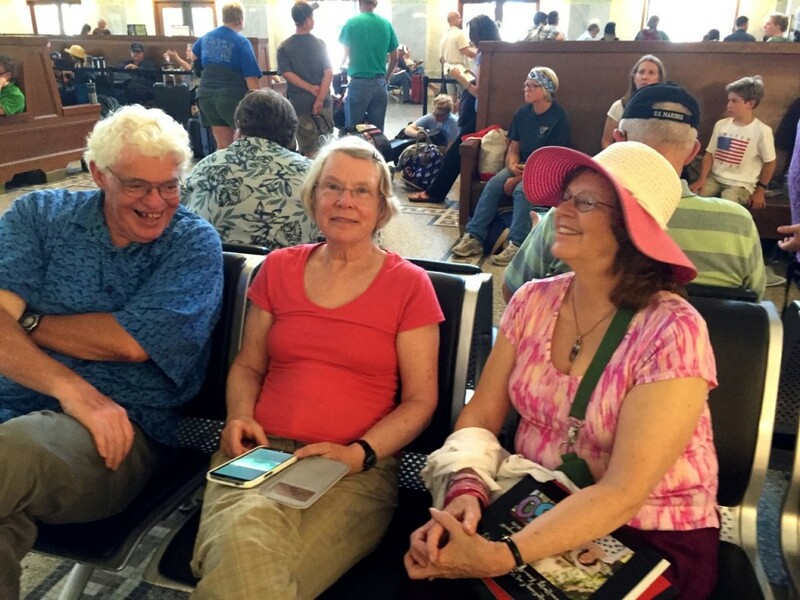 Our fellow passengers seemed relaxed and happy, and everyone we talked to said they were really enjoying the journey. There were lots of families with kids of all ages, a good number of grandparents, and retired people like us. 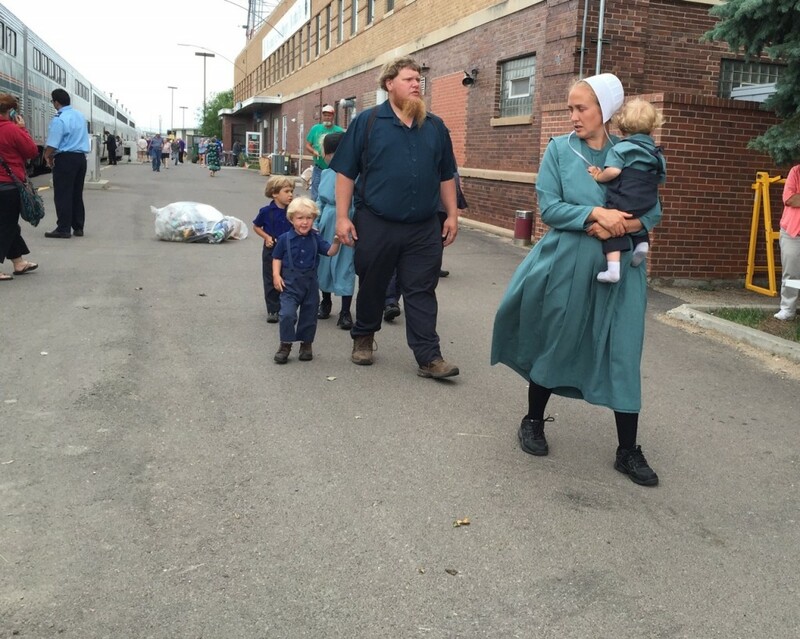 A fairly large group–25 or 30 people–were Amish, who we later learned used this train all the time because they do not take airplanes. It was a Middle American kind of crowd though not very diverse as to race or ethnicity, so in that sense not really representative of our country. 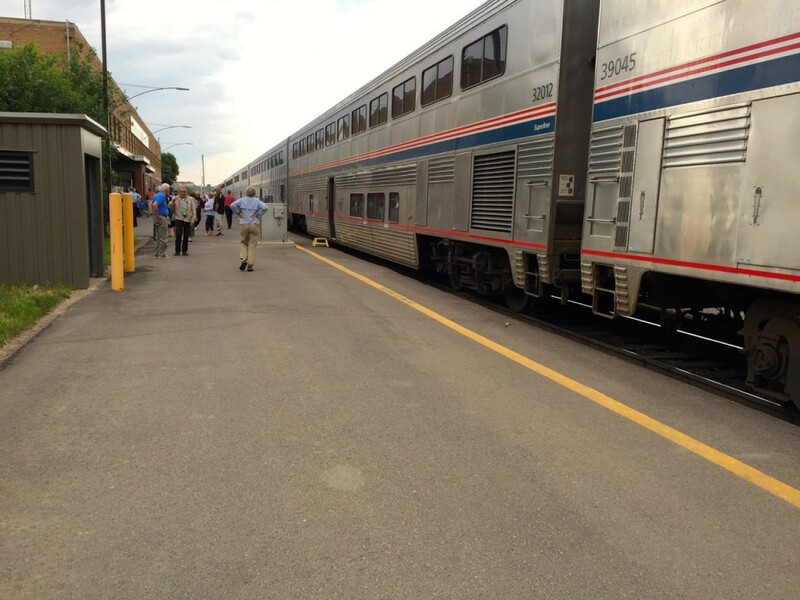 But it felt good finally to be on The Empire Builder and good to be going home. The question for today was when might we expect to arrive in Chicago and would we make our two-hour connection to the train going to Washington. We woke up to rain and clouds and vast green fields of soybeans, alfalfa, and corn. I assumed we must be in Minnesota. At breakfast we learned that this was not Minnesota. In fact we had not yet reached Fargo, South Dakota, and now were officially running more than eight hours behind schedule. We were told this was due not to equipment failure, the usual culprit, but to having to “give way” to an unusually high number of freight trains. Also there was rumor of a car parked on the tracks. 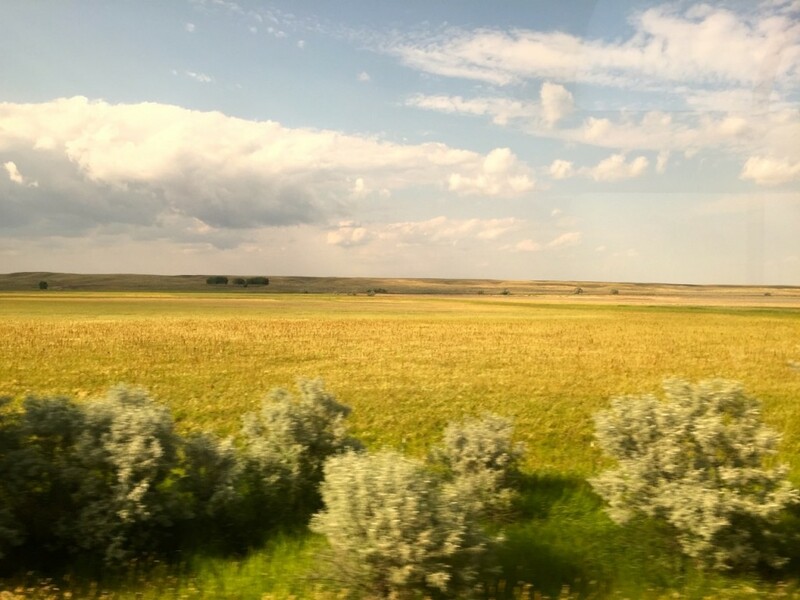 We sat with two members (mother and teenage daughter) of a family from a small town outside of Madison, Wisconsin, who used the train regularly to visit parents and grandparents in Montana. Of the dozen or so trips they had taken over the years, the train had never been on time but usually was only an hour or two late, often as much as four hours, but nothing like this, though the mother talked about delays of as much as 12 or even 24 hours that her parents had endured. Every year, she said, it seemed to be getting a little worse. 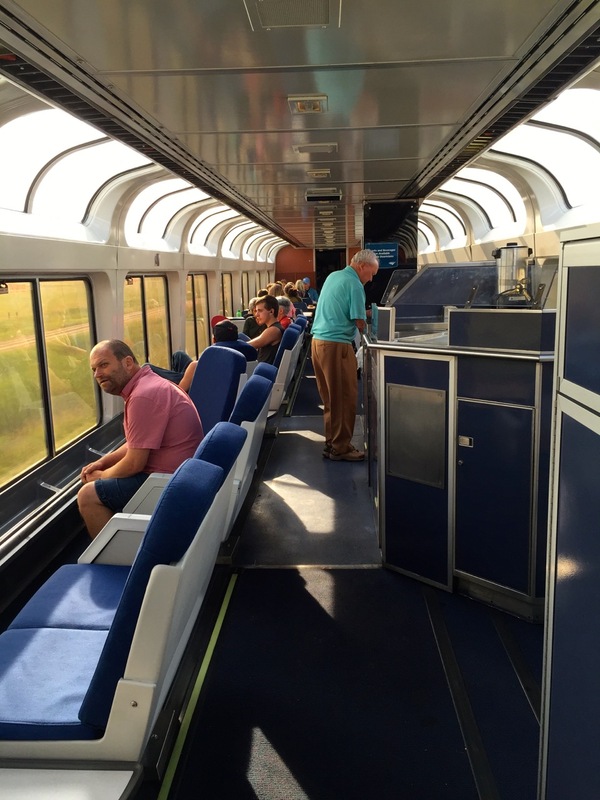 The Empire Builder chugged along during afternoon and evening as we sat in the club car, listened to a “Rails and Trails” Park Service volunteer talk about the history of the area, and enjoyed the beautiful scenery. The grass became greener and trees reappeared along with crops of corn and soybeans. When we reached the Minnesota we traveled alongside the Mississippi River into Saint Paul and then followed the river toward Milwaukee. There were more small farms than we had seen before, many of them fairly prosperous. The light of the late afternoon sun was spectacular. 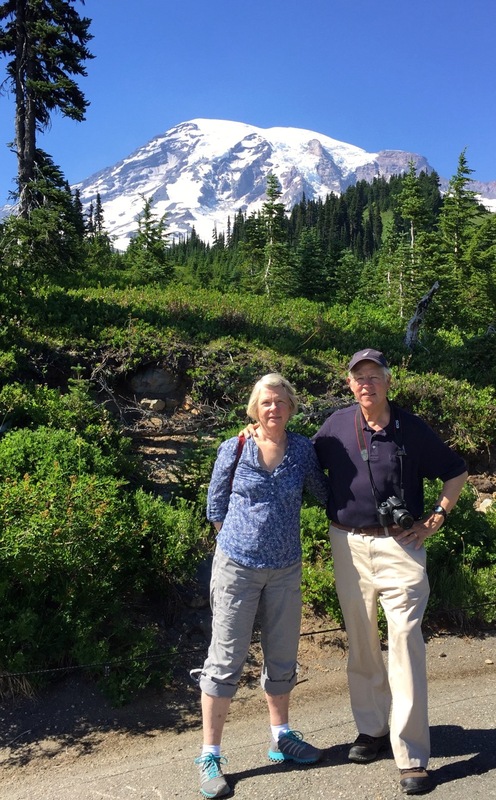 Travel guides describe the journey as being special when you cross the Cascades and the Rockies, but actually the scenery is quite beautiful the entire trip. You certainly can begin to get a feel for just how big—and how beautiful—our country is. We were sorry when twilight came and then darkness with four more hours to ride without being able to see the landscape. When we finally rolled into Chicago at midnight, it was raining. We were exactly on time to the minute according to the estimate we received at breakfast that morning—but a full eight hours behind the original schedule. Everyone on the train with a connection to another location was stranded. Now you might think that this would raise some questions as to why in the richest and most powerful country in the world our trains would run eight hours behind schedule, and in every other country we visited the trains ran exactly on time. Indeed, I had been asking that question throughout the entire journey on the Empire Builder. Embry, on the other hand, was loving every minute. This is what she had in mind a couple of years ago when she first had the idea of a trip around the world after she retired. I am not totally sure what she envisioned, but my image was that she would be traveling in a Third World country where nothing was reliable and she would just roll with the punches and see what happened. I had images of crowded buses, mired in mud in dirt highways in the Congo, third class hotels, backpacks, hitch hiking—activities making the experience truly authentic, but for a 20-year old, not a 70 year old! When I volunteered to join her last year, the concept changed from hardscrabble, third class to first class-all-the-way-baby. Embry was gracious to go along with me on this adjustment in concept and probably secretly was delighted to have a respectable way out of her fantasy. But now, on the last leg of the journey, she was having the experience she had longed for—an authentic, Third World experience where nothing was ever on time and you never knew what would happen next. She was in heaven. An Amtrak employee came on the loudspeaker just before we pulled in and announced that everyone who had a connection that was messed up would have a hotel room, compliments of Amtrak. The remaining, bedraggled passengers stumbled off the train into a chilling drizzle and headed as directed to “passenger services” where after searching for the right place for awhile, we were met by a lone Amtrak employee. He herded us all into a large waiting room and motioned for us to sit down. I counted how many of us there were—over 150. No one complained, not even one grumble. A bunch of people sat on the floor because of a shortage of chairs including one guy in his thirties with two huge dogs, a German Shepherd and a dog that looked sort of like an enormous boxer. I had noticed him on the train as I passed through his car on the way to the observation lounge. The two animals were seated in the train’s passenger seats. He was seated on the floor. Around 12:30 am, the Amtrak representative began calling out names. When you heard your name called, you reported to the office where you received your various vouchers—one for a taxi, another for the hotel and a $10 voucher for a fine dinner in Chicago, which could be used only inside Union Station where all restaurants , of course, were closed. We were lucky. Our name was the third called. There were about 145 people behind us. It took about five minutes for a clerk to process one passenger, and only two clerks were on duty. I did the arithmetic and calculated that it would be well over two hours before the last, weary passengers had what they needed for the hotel. But that was, thankfully, not our problem as we rushed to the office, obtained the vouchers and boarded a cab at 12:45 am to take us to the hotel. At one in the morning we arrived at The Michigan Inn, which turned out to be the coup de grace for Embry. The lobby was shabby and plain but clean, the carpets in the halls wrinkled, torn wall paper along hall corridors, dirt marks on the walls, busted toe rails, and the rooms pretty bare, but clean. So this turned out to be one of the best legs of the trip for Embry, a taste of what her original idea of the trip around the world might have been like, a great way to end our Big Trip. I had to agree. Her original plan might not have been all that bad. However, does it strike anyone as ironic that our authentic “Third World experience” occurred on the Empire Builder and in the city of Chicago in the United States of America? We checked our email to find a confirmation of a booking leaving at 6:40 pm, the same train we should have been on the day before. We made the best of it by visiting the AT&T store and getting a SIM for my iPhone that I had purchased in Paris to replace the one that was stolen and fixing Embry’s email, which had stopped working. Then we met the former rector of All Soul’s Church, John David van Dooren, for lunch at the Corner Bakery near our hotel. It was a special treat to see this extraordinary Episcopal priest and good friend. He and his partner, Gary, have settled into Chicago where they both have great jobs. John David’s church is a thriving, (mainly) blue collar, very diverse, Anglo Catholic church, and Gary is assistant principle at a Chicago public elementary school. After lunch we took a cab to the station where we sat outside in the sun and caught up with email before the train left, this time miraculously on time. The most interesting thing about our last day was breakfast with a tall, bearded guy from Southern California probably in his mix 40s, using a cane. He had a gold cross around his neck and we thought at first he might be Amish since there were a number of Amish passengers on the train. He was Christian but a member of an “extremely conservative” non denominational church. We pretty much got his life history. He was divorced, unemployed and going to South Carolina from California to visit his elderly mother. He had been involved in “not really legal” activities as a young adult but converted to Christianity when his father died and cleaned up his life, working at Wal-Mart on the night shift for some 20 years before retiring with disability due to a shoulder injury and epilepsy. He was obsessed with “upholding the constitution,” was home schooling his teenage son, and was a strong supporter of Ted Cruz. He was considering joining a Christian militia. His big complaint was the government giving a free ride to people who do not work. We listened attentively and resisted the temptation to point out that by receiving disability payments, he too was in fact receiving government assistance. When I asked him if the Christian militia had used their guns, his response was “not yet,” with an usually strong emphasis on the last word. The train traveled along valleys and streams in Pennsylvania and West Virginia where streams were near flood stage, and the landscape was a deep green. 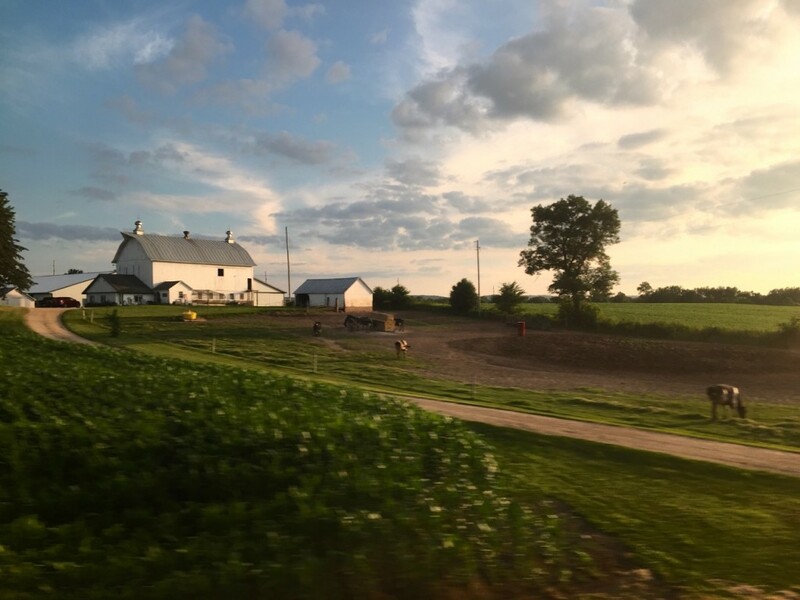 Rail and Trail volunteers joined the train in West Virginia and provided a historical commentary as we chugged along to Maryland and then DC. When you get down to it, this part of the world is as beautiful as any we visited. Hold your hats! Big news! 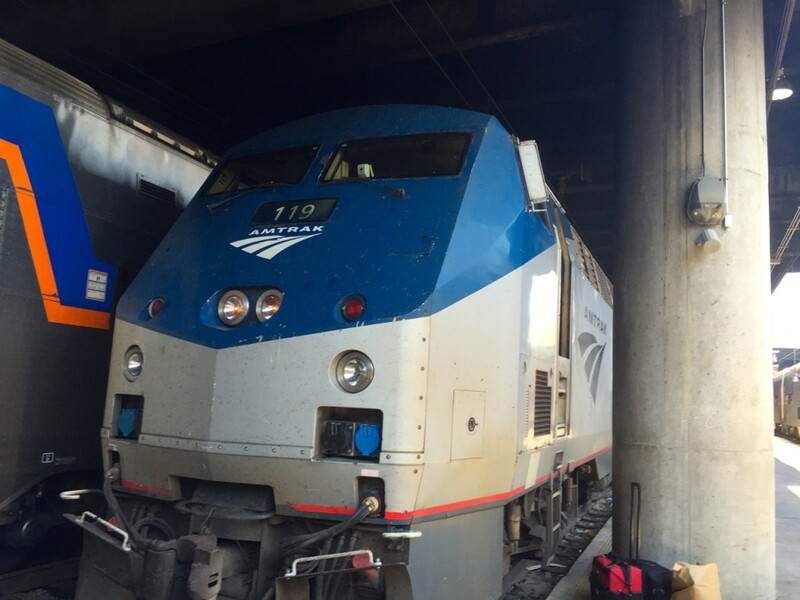 Amtrak “Train 30” arrived on time at Washington’s Union Station at 1:00 pm on Friday, July 10, 2015. Our Big Trip was officially over. We were met in the station by our nephew, Alex, and our good friend, Naomi, who had been our house sitter for the time we were gone. 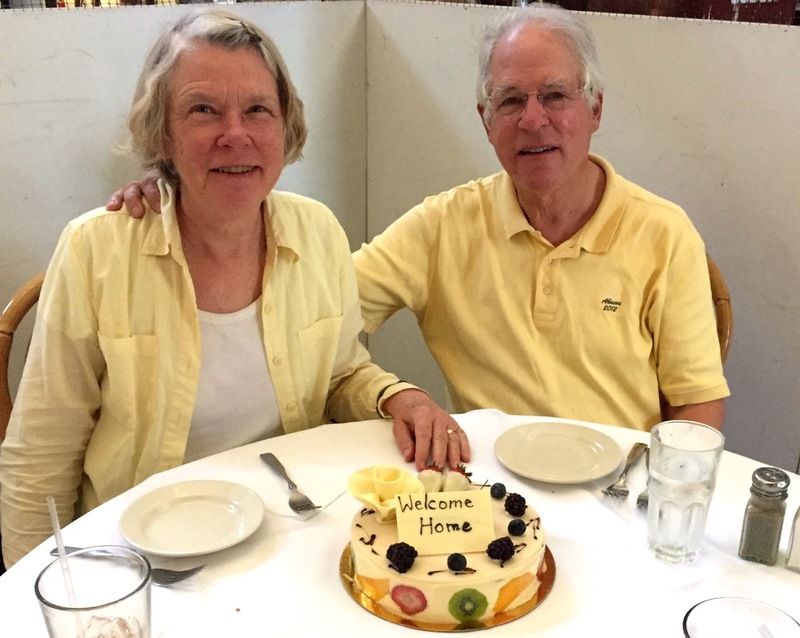 Naomi produced a “Welcome Home” cake, which we enjoyed eating in the station before heading to Macomb Street. What a trip it was! One more email will follow which will try to sum things up. Many of you have been loyal and faithful followers to whom I am deeply grateful. Knowing that people were reading some or all of these posts kept us going. Several of you deserve special recognition: Embry’s older brother, Mike Martin, who is a writer, poet and artist and whose blog comments are themselves poetry; Bruce Swain, old friend from Davidson days, college writing and communications professor and our de facto writing coach, who has provided helpful and insightful suggestions and comments along the way, and both of our children, Andrew and Jessica, and their families who have been supportive of the blog effort, especially Andrew, who has cleaned up several of the posts and put in photos when our internet connections did not permit it. Thanks to each of you! And thanks to everyone else for following us. Odd as this may seem, the blogging part of the Big Trip is near the top of my plus list. I loved doing it. And Embry did too. She also kept a detailed diary, which will add considerable depth and detail to a book effort if we ever get around to it. We would appreciate any thoughts you might have regarding whether you think the idea is worth pursuing. So the Big Trip is over. It was Embry’s idea in the first place and a great adventure that would never have happened without her indefatigable spirit . We had a great time together and ended with a stronger marriage than before we began. So my greatest thanks goes out to her for her curiosity, free spirit, determination, honesty and most of all, for her love. What a great journey. I followed you every step of the way and looked to each new post. Thanks for taking us along through your blog. i find myself tearing up to be reading your final words. Yes, there is good reason to turn this adventure into a book. First, 70-year olds need adventurous examples of what they can actually be doing; secondly, for those who cannot make the trek themselves, what better way to be an armchair round-the-worlder than to read this thoughtful, humorous, and fascinating commentary; and thirdly, is there a project you would rather be devoting your time to? The unanswered questions may deserve some more thought — train travel, diversity, what really matters. go for it! Welcome home. Bravi! And I remain first in the queue for the book! I think perhaps a small part of each of us wondered if you would actually make it home… And you did! But what next, now that the long anticipated Big Trip is over? Welcome HOME! You might have caught it by now, but haven’t made your correction yet: you say ‘Fargo, South Dakota’, when in truth, Fargo is in NORTH Dakota.